We are offering Chain Conveyors to our clients. We are engaged in offering a quality approved array of Chain Conveyor. The Chain Conveyor we offer is widely demanded amongst the clients for its availability in various sizes and specifications. Besides, these products are suitable for lifting heavy material. 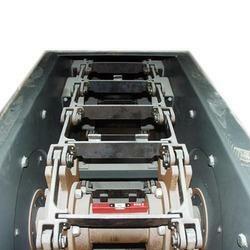 Matching up with the ever increasing requirements of the customers, our company is engaged in providing Chain Conveyor. We are highly acknowledged organization engaged in presenting remarkable range of Slat Chain Conveyor. 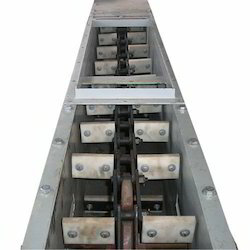 A scraper flight conveyor consists of metal, wood, or plastic flights attached at uniform intervals to one or two strands of endless chain which moves the flights along in a trough, the chain or chains passing around sprockets at the end of the trough. Material can be discharged at any point along the trough through gates or at the end.